As we reach the end of July (in the year of 2017), the films being released this year have been hit or miss, with some being poignant, profitable, and well-received, while others have been dismal, shallow, and flat out box office bombs. And that doesn’t count all the other movies that fall in-between these two extremes. For the varying films genres, there’s been some well-received / box-office success 2017 movies ranging from horror (Spilt), to action (The Fate of the Furious), to kid-friendly (Beauty and the Beast), to superhero blockbusters (Wonder Woman or Spider-Man: Homecoming) and so on and so forth. However, the comedy films of 2017 have been seriously lacking from mediocre hits like How to be a Latin Lover and Going Out in Style to disappointing ones like Rough Night, Snatched, Fist Fight, and Baywatch. As of yet, there really hasn’t been a good 2017 movie. Now, in way to rectify that, Universal Pictures and director Malcolm D. Lee present the newest comedy film Girls Trip. Does this latest comedy romp rise above its 2017 predecessors or does it fail (like so many others) to find its humor within its story? Ever since the 1990s, the “Flossy Posse”, a group of four women, have been together and shared a lifelong friendship bond with each other, making memories whenever they meet up. However, time change and their lives have taking each of ladies into different direction: with Dina (Tiffany Haddish) recently unemployed and who hasn’t put her wild younger years aside, Lisa Cooper (Jada Pinkett Smith) is a single mother of two and more of a conservative about her sexuality and outgoing of life, Sasha Franklin (Queen Latifah), a once promising journalist, but is a lowly celebrity gossip blogger who is running out of money, and Ryan Pierce (Regina Hall), who is on the cusp of media success, with her self-help brand about shopped to the big time at the Essence Festival in New Orleans, sharing the glory of her success with her famed football player husband Stewart (Mike Colter). Deciding to use her time in New Orleans to reconnect with her old Flossy Posse on this trip, Ryan invites her girlfriends for a weekend of partying and revelry, unprepared for all the personal baggage of the group. As the weekend begins to unfold, secrets and truths start to revealed themselves as each of the four women discovers that this “girls trip” is in dire need for all of them. While I’ve seen a lot of the mainstream 2017 movies (as of this date that I’m writing this review), I’ve seen plenty of that have either reached financial success or flat out bombed at the box office. These two categories include many big named or much hyped films that either exceeded expectations like John Wick: Chapter 2, Patriots Day Beauty and the Beast, Spider-Man: Homecoming, and Dunkirk or just completely missed their mark and / or didn’t live up to their inherit hypes like Alien: Covenant, Pirates of the Caribbean: Dead Men Tell No Tale. And The Mummy. As I stated above, the 2017 movies (so far) have yet to produce a comedy film that resonate with viewers, finding a balance between story and humor. Movies like CHiPs, The House, Baywatch, Snatched, and Rough Night all tried to become the year’s best comedy film, but each one failed, with most being ripped apart by critics and moviegoers as well as failing to produce big dollar amount numbers at the box office. So, this bring me to my review for the movie Girls Trip. If I’m being honest, this movie really wasn’t on my radar to see / review as I overlooked for other films out there, which is why I didn’t even post the film’s trailers on my blog. Eventually, I did catch the trailers in theaters (didn’t see much of them during the 20-minute previews in my theater outings) as I found them to be quite humorous and funny, peaking my interest to see the movie when it came out. Unfortunately, with Dunkirk and Valerian and the City of the Thousand Planets coming out the same week, I chose to watch those two films first before I had a chance to see Girls Trip. So…what did I think of it? Did it beat out all the other 2017 comedy films? In truth, yes…it does. While it doesn’t break any new ground, Girls Trip is both hilarious funny as well finding its own charming within its more dramatic / character moments. Girls Trip is directed by Malcom D. Lee, whose previous works include The Best Man, Undercover Brother, Barbershop: The Next Cut, and Welcome Home, Roscoe Jenkins. At first glance, the film is very similar to the other 2017 movie Rough Night (i.e. a comedy movie that’s about a group of women that get caught up in crazy situation with plenty of comical situations). However, while that particular film failed to impress (I still haven’t seeing the movie, but I’ve read reviews and heard “word of mouth” from people who have), it seems like that Lee’s Girls Trip seems to be like what Rough Night should’ve been. Of course, being a comedy movie, Girls Trip does deliver on that account, with Lee staging a plethora of R-rated jokes and crazy gag situations for the four Flossy Posse girls to encounter and / or experience. Yes, the movie’s humor is a bit raunchy at times (that’s to be expected) and even a bit over-the-top (one particular one involves a zip-lining and urination), but a lot of these jokes / gags are quite funny, especially on their creative notion and / or delivery from actresses (more on the below). 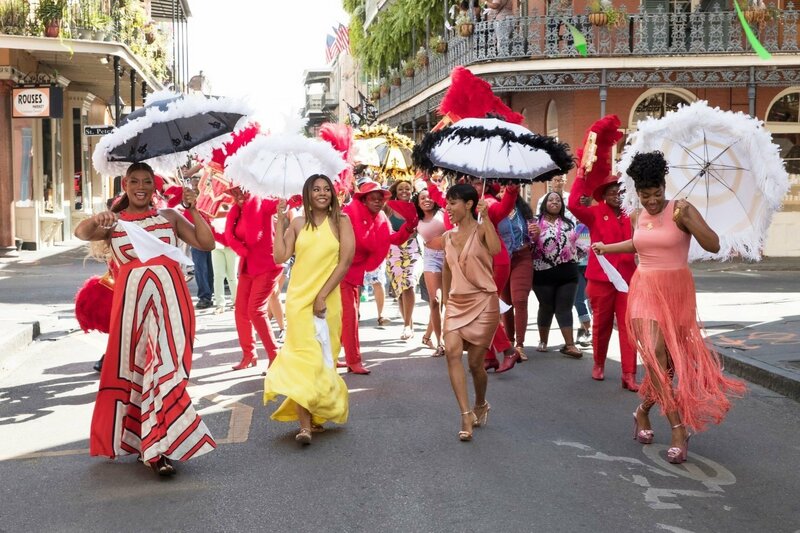 What makes Girls Trip also stand out is that the film itself is more crafted than other comedy movies as Lee finds balance humor and character moments. Of late, comedy films have the same ingredients (a humorous premise, jokes, a few crazy situations, and a handful of comedic character actors to perform in the movie). However, these movies ultimately fail because they usually have a weak narrative premise that, while good on paper, doesn’t translate quite well when making a feature film (see CHiPs, Baywatch, and The House). Girls Trip succeeds at this because Lee, along with the film’s writers Kenya Barris and Tracy Oliver, make a more wholesome / well-rounded narrative rather than a shell-of-a-story with just crude jokes and humor. Additionally, Lee makes the most of the film’s setting, using New Orleans as the perfect backdrop to see these four women (partying and drinking) throughout the nightlife in the “Big Easy”. Also, the film, while circumnavigating through all the humorous and sometimes raunchy shenanigans, does find time to incorporate some underlining messages within the picture, creating a sort of pathos for these women, which includes the tight sisterhood bond between lifelong girlfriends as well as being stuck in an unhealthy relationship with a partner (posing the fundamental question of “being with someone in an abusive / uncaring relationship versus being alone). It’s not common for comedy movies to usual find an underlining message within its context (see Bad Moms, Sisters, Hitch, etc. ), but Girls Trip finds a better harmony when using these moments within the feature. Girls Trip doesn’t walk away completely unscathed from criticism. For starters, with a runtime of little bit over two hours (two hours and two minutes to be exact), the movie does feel pretty long. Sure, all the jokes and gags in the film are bountiful and the character moments are a bit meaningful, but the movie overextends itself a bit and could’ve had at least ten to fifteen minutes shaved off its final cut to make the film focused. The best of example of this is when the Flossy Posse girls dress up in disguised outfits and do a dance number (roughly around the end of the second act of the film). It’s a fun scene to watch with several laugh out-loud moments, but really doesn’t serve the film’s main plot points. There are a couple of more moments like that, while funny, just are unnecessary. It doesn’t hurt my overall enjoyment of the film, but you get what I mean. In addition, the movie also is fairly predictable, following a fairy well-trodden narrative path with many of the film’s outcomes easy to predict before they happen. Again, Girls Trip isn’t really breaking any new ground, but its presentation rises above where others have failed. Thus, its negative (to me at least) can be slightly overlooked and less-bothersome. Perhaps one of the biggest reasons why I liked Girls Trip (and reason for many) was the four leading actresses that paid four Flossy Posse women in the movie. 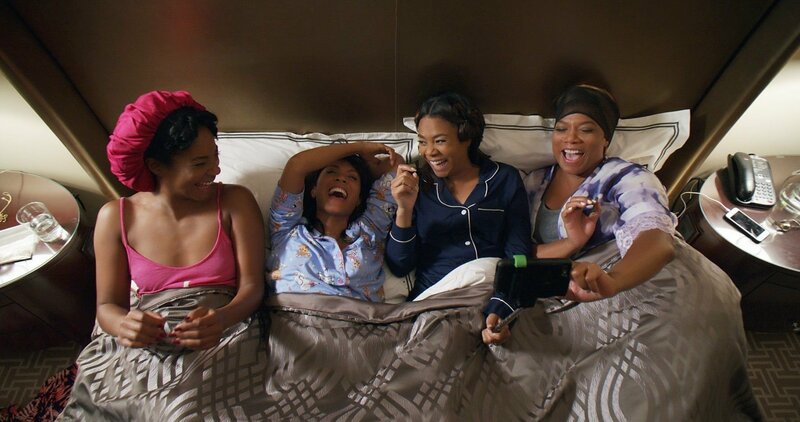 Of course, the standout performance of the foursome has to be Tiffany Haddish as the wildly out-of-control Dina. Haddish, known for her roles in The Carmichael Show, The Legends of Chamberlain Heights, and Keanu, uses her charismatic personality in explode, with plenty of physical comedy gags (one involving a grapefruit and a banana is super funny) and hilarious inappropriate one-liner jokes, making Dina one of the most memorable (if not the funniest) characters in the entire movie. Behind her is Jada Pinkett Smith as the now more conservative Lisa Cooper. Due to her character’s setup, Smith, known for her roles in Bad Moms, Gotham, and Hawthorne, has a lot of comical scenarios to play out and executes them with humorous precision as well as finding a balance between comedy and drama within her character of Lisa. Lastly, Regina Hall, known for her roles in Law Abiding Citizen, Think Like a Man, and Scary Movie, and Queen Latifah, known for her roles in Living Single, Chicago, and The Secret Life of Bees, are the more plot dynamic / character driven moments of the feature (i.e. the more straight-laced individuals), with their respective characters of Ryan Pierce and Sasha Franklin. Yes, they do join in the fun for several comedic bits, but are probably are more paramount to Girls Trip’s narrative rather than Haddish and Smith’s characters. With the film being centered around the four Flossy Posse girls, Girls Trip really doesn’t have much of a supporting cast. In a way, that’s kind of a good thing as Lee keeps the focus on Haddish, Hall, Latifah, and Smith’s characters rather than unnecessary side characters. The only two that are truly noteworthy in the feature is Mike Colter (Luke Cage and Agent X) as Ryan’s husband Stewart Pierce and Kate Walsh (Grey’s Anatomy and 13 Reasons Why) as Ryan’s publicist manager Elizabeth Davelli. Both are allotted enough time for each of them, whether humorous bits or character moments, to make an impact on the film’s story. 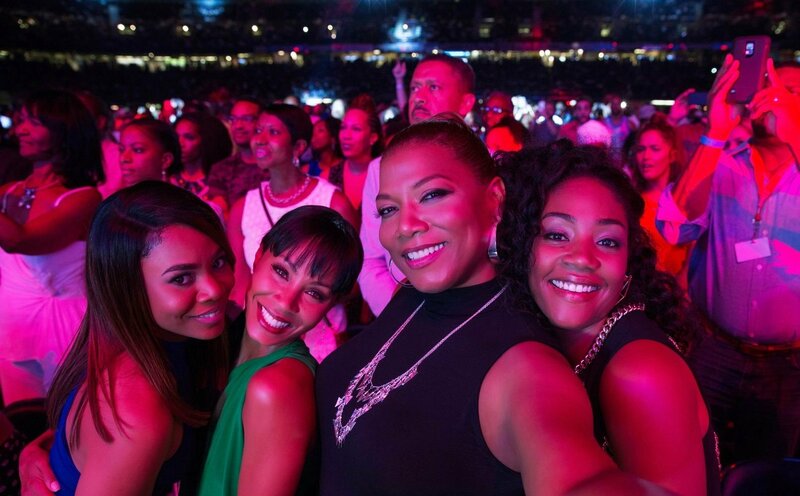 Girls Trip also utilizes the chance to use a lot of African-American musicians / celebrities as the movie’s takes place during an Essence Magazine (a monthly magazine company for African-American women) festival. So, Lee incorporates that into the film and brings a lot of celebrities to make small cameo appearances including Mike Epps, P. Diddy (Sean Combs), New Edition, Common, Mariah Carey, Ne-Yo, Faith Evans, Maxwell, and Iyanla Vanzant. 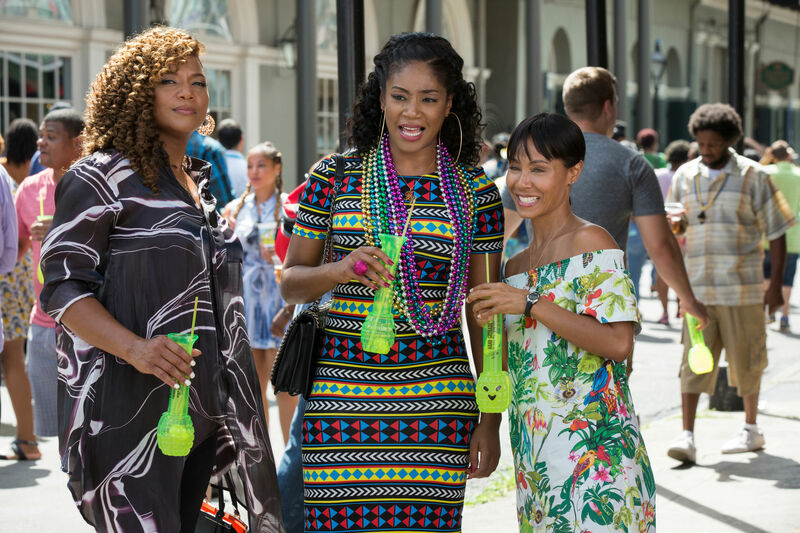 The Flossy Posse reunite in New Orleans for a weekend adventure of drinking, tomfoolery, and discovering more about themselves (and with their girlfriends) in the film Girls Trip. Director Malcolm D. Lee newest movie is fun example of how to do an R-rated comedy movie right. It’s fun, entertaining, humorous, and even heartfelt within its more dramatic character moments. While the movie isn’t anything original or groundbreaking for the genre and some gag jokes are a bit over-the-top, the movie is still uproariously funny with plenty of raunchy humor to laugh out loud at as well as actually caring about these four women, thanks to the writers and to the talented four actresses who portray them. Personally, I liked this movie. Like I said, its nothing totally new, but it’s definitely funny and has a lot to offer than most comedy films of late. Thus, I do highly recommend this movie, especially for fans of R-rated comedies. Its definitely worth the trip. While there’s other comedy movies coming out before the year of 2017 ends (Bad Moms Christmas and Pitch Perfect 3 are prime examples), Girls Trip is, as it stands, the funniest (and raunchiest) comedy movie of the year. We’ll just have to wait and see if it can hold to its crown for the remainder of the year. I’ve heard this was surprisingly good. Definitely is. I wasn’t expecting it to be either. I really enjoyed this one!!! I know right. I was somewhat expecting it to be a mediocre endeavor, but its one of my favorite comedy films of the year (so far at least). I was also pleasantly surprised by this one! I was too. I wasn’t really expecting this movie to be as funny as it was. Whaaaaat?! I couldn’t watch the first 20 minutes of this. Does it get amazingly good after that? Interesting review though! Yeah, it did. I mean in comparison to the other comedy films of 2017 (Fist Fight, CHiPS, Baywatch, and Snatched), Girls Trip shines immensely.